More often than not, you need to work with others to get things done. 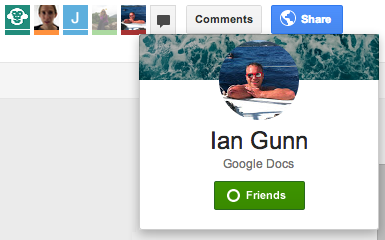 Today, working together in Drive is getting even easier with new profile pictures and one-click group chat. Now when you open a file in Drive, you’ll see the profile pictures of other viewers at the top instead of just their names, making it easy for you to do a quick scan of who else is in the file. You can hover over a photo to see details about the viewer and add them to your circles on Google+ — all without ever leaving Drive. In addition, you can now start a group chat with just one click. Simply select the new chat button at the top right and a chat box will appear, making it easy for you to quickly message everyone in the file.